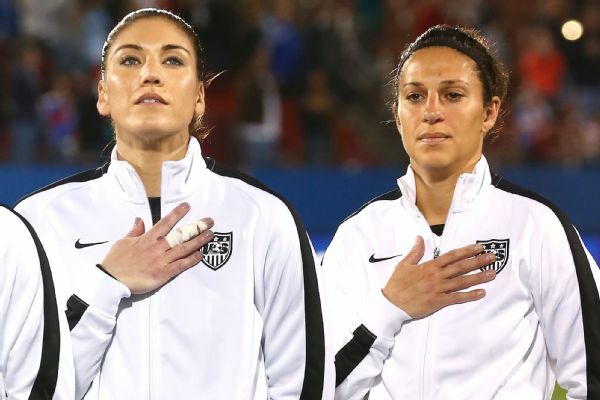 Five members of the U.S. women's national soccer team -- including stars Hope Solo, Carli Lloyd and Alex Morgan -- have filed a wage-discrimination action against the U.S. Soccer Federation with the Equal Employment Opportunity Commission. The filing, citing figures from the USSF's 2015 financial report, says that despite the women's team generating nearly $20 million more revenue last year than the U.S. men's team, the women are paid about a quarter of what the men earn. "Recently, it has become clear that the Federation has no intention of providing us equal pay for equal work," Megan Rapinoe said in a news release, after also attaching her name to the filing along with Becky Sauerbrunn. The EEOC will conduct an investigation and determine if its findings warrant compensation to the U.S. women's team. The action was filed by the law firm of Winston & Strawn and its co-chairman Jeffrey Kessler, who has represented numerous players' unions and athletes -- including Tom Brady and Ray Rice -- in disputes with professional leagues and organizations. "In early January, the Women's National Team Players Association submitted a reasonable proposal for a new CBA that had equal pay for equal work as its guiding principle," Kessler said in the statement. "U.S. Soccer responded by suing the players in an effort to keep in place the discriminatory and unfair treatment they have endured for years." 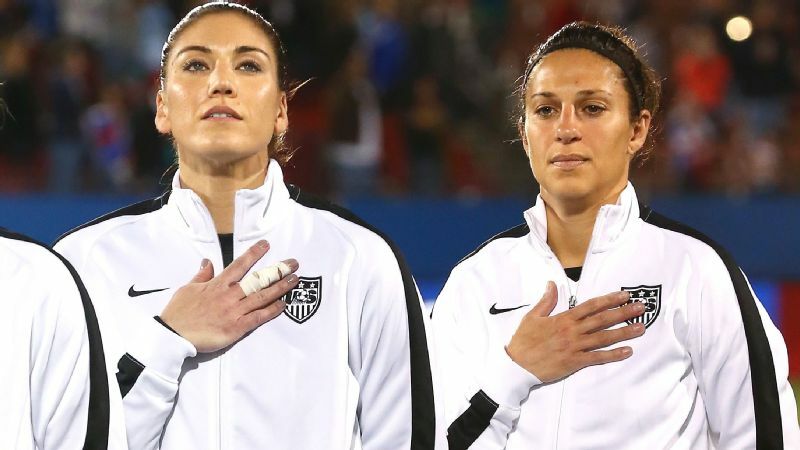 Carli Lloyd and Hope Solo are among the U.S. women's team players filing a wage-discrimination action against the USSF, saying the women are paid almost four times less than the men's team, despite generating nearly $20 million more in revenue. U.S. Soccer, after issuing a statement saying it was "disappointed" that the action was taken, issued a second statement Thursday afternoon, saying it is "committed to and engaged" in negotiating a new CBA "that addresses compensation with the U.S. women's national team when the current CBA expires at the end of this year." USSF President Sunil Gulati said Thursday night that many factors are considered when it comes to player compensation, including the revenue the teams generate. "We think very highly of the women's national team and we want to compensate them fairly, and we'll sit down and work thru that with them when all of this settles down,'' Gulati said. Kessler claimed that the state of the negotiations over the CBA created the need for the women to act in hopes of ending what they say is the "discriminatory and unfair treatment" they have endured for years. Solo, appearing with Lloyd on NBC's "Today" on Thursday, said "not much has changed" during her time on the team. "I've been on this team for a decade and a half, and I've been through numerous CBA negotiations, and honestly, not much has changed," Solo said. "We continue to be told we should be grateful just to have the opportunity to play professional soccer, to get paid for doing it. U.S. Soccer, citing its investment in the National Women's Soccer League, said it remains committed to the women's game. "Our efforts to be advocates for women's soccer are unwavering," the statement said. "For 30 years, we have been a world leader in promoting the women's game and are proud of the long-standing commitment we have made to building women's soccer in the United States and furthering opportunities in soccer for young women and girls around the world." Fearing that the women's team would strike ahead of this year's Olympics, U.S. Soccer said last month it "reluctantly" filed suit in a Chicago federal court to "confirm the existence" of a collective bargaining agreement with the union representing the U.S. women's team. "I think the timing is right," Lloyd told NBC's "Today" on Thursday. "I think we've proven our worth over the years. Just coming off a World Cup win, the pay disparity between the men and women is just too large. We want to continue to fight. The generation of players before us fought. And now it's our job to keep on fighting." Tim Howard, the men's national team goalie, told SportsCenter on Thursday that the men's team supports the women's team fight. "We support the fact that the women should fight for their rights and fight for what they think is just compensation. We, on the men's side, have been fighting that battle for a long, long time," Howard said. "We certainly know what it feels like. We felt underpaid for a long time. We had to negotiate our way to a settlement." Landon Donovan chimed in on Twitter. And even presidential candidate Hillary Clinton took to social media to back the women's players. Among the numbers cited in the EEOC filing: The women would earn $99,000 each if they won 20 friendlies, the minimum number they are required to play in a year. But the men would likely earn $263,320 each for the same feat, and would get $100,000 even if they lost all 20 games. Additionally, the women get paid nothing for playing more than 20 games, while the men get between $5,000 and $17,625 for each game played beyond 20. "Every single day, we sacrifice just as much as the men. We work just as much," Morgan told "Today." "We endure just as much physically and emotionally. Our fans really do appreciate us every day for that. We saw that with the high of last summer. We're really asking, and demanding now, that our federation, and our employer really, step up and appreciate us as well." The pay for playing in the World Cup is also greatly disparate, according to the figures. The U.S. women received a team total of $2 million when it won the World Cup last year in Canada. Yet when the U.S. men played in the World Cup in Brazil in 2014, the team earned a total of $9 million despite going just 1-2-1 and being knocked out in the round of 16. "We are the best in the world, have three World Cup championships, four Olympic championships, and the [men] get paid more to just show up than we get paid to win major championships," Solo said. In a conference call with reporters, Kessler said, "The reality is that this team is more valuable to the USSF than the men's team has been. That's what the facts show. And they would be justified in asking for more than the men are receiving. But the first step that they are seeking is equal treatment. That should be an easy step for the USSF to take." "We want to play in top-notch, grass-only facilities like the U.S. men's national team," Morgan said. "We want to have equitable and comfortable travel accommodations, and we simply want equal treatment."